The Islamic Society of Boston (ISB) has long established itself as one of America's most virulent wellsprings of Islamist activism. Originally founded in 1981 by Muslim Students Association members from the surrounding universities -- including the Al Qaeda operative Abdulrahman Alamoudi, who 20 years later would plead guilty to conspiring to assassinate the Crown Prince of Saudi Arabia and receive a 23-year prison sentence -- and formerly affiliated with entities established by the Muslim Brotherhood, the ISB has frequently hosted fundamentalist imams preaching hateful doctrines. 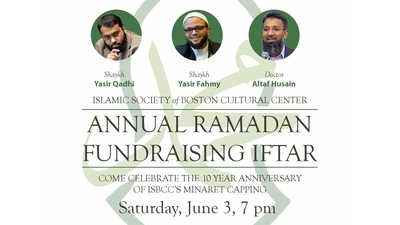 Now, with tomorrow's Ramadan fundraiser, the ISB reaffirms its position as the vanguard of Islamist hate in America. The featured guest will be Yasir Qadhi, a Salafi imam with a long record of preaching hateful views about Jews, gays, Christians, liberals, adulterers, Shia Muslims, and non-Muslims. Due to his extreme ideas, the United Kingdom's Charity Commission is currently investigating a charity for hosting him. Qadhi claimed to recant of his anti-Semitic views in 2008, but around the same time, he also expressed support for the prominent Holocaust denier David Irving. Qadhi is comfortable with arguing for the murder of homosexuals. "...this is a part of our religion to stone the adulterer and to chop the head off of the sorcerer and so many other things, and to kill, by the way, the homosexual – this is also our religion. The fiqh rulings say that the homosexual be killed, OK? ... This is all a part of our religion. This doesn't mean we go and do this in America... but I'm saying if we had an Islamic state we would do this." In other sermons, Qadhi rejects democracy as illegitimate; and attacks Christianity as an "evil lie" and a "monstrosity." Qadhi serves as the Dean of Academic Affairs at Al Maghrib, a Salafi religious training organization with its own connections to Islamist violence and apologists of extremism. One former Al Maghrib student was Umar Farouk Abdulmutallab, the infamous "underwear bomber." Qadhi's colleagues at Al Maghrib include Muhammad Alshareef and Abdullah Hakim Quick, who have respectively described Jews as "cursed" and "filth." Quick also defends executing homosexuals, while Alshareef insists on stoning adulterers. Boston's politicians and faith leaders have often attended the ISB's events. Let's hope that this time, they think twice about legitimizing this extremist institution and its hateful speakers.